The Banker Blueprint is a proven, step-by-step action plan for landing a high-paying job in investment banking, private equity, or hedge funds. The Banker Blueprint Report: This information-rich 57-page guide gives you a proven action plan for breaking into investment banking, including how to tell your story, network, craft a winning resume, and dominate your interviews. Free Banker Blueprint newsletter delivered weekly, with more in-depth advice from experienced investment bankers and other finance professionals. Unlimited access to all past articles, videos, and content. Free updates whenever we write new articles or conduct new interviews. We respect your privacy, and you can unsubscribe whenever you want. 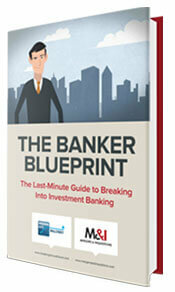 Fill in the form now and look out for The Banker Blueprint confirmation email in your inbox in a few minutes!